The Mesh Rashi 2015 predictions show that the planetary positions are beneficial for you this year. Year 2015 will prove to be a good year with positive results for the Mesha Rasi people. You will overcome obstacles created by your competitors and the first half of the year will be highly encouraging. The Mesh Rashifal 2015 foretells that this year is not ideal for asserting yourself. The cooperation of others will be necessary to accomplish your goals in life. You should be flexible and listen to the opinion of your friends and relatives. The 2015 career astrology predictions for the Aries zodiac sign point to a better second half. Businessmen will start new projects. Professionals will get support from their superiors. Investments made in business ventures will be profitable. Financially, according to 2015 Bhavishya Rashi Jyotish this is an excellent year throughout. Students have to put their best foot forward to get the necessary results. Focus on your studies and success will be yours. You can even take a look at the Chinese Horoscope 2015. 2015 Rashiphal for Mesh Rashi foretells that the second half of 2015 will be auspicious for love and marriage. Avoid any romantic alliances in the first half of the year. More attention towards domestic problems is necessary during the second half, forecasts the Mesh Rasifal 2015. Family affairs will be harmonious during the first half of the year. This period is suitable for adding luxuries such as a new car, provided you take necessary action. If you want to make new additions to the family, second half will be ideal. Travel overseas is possible during the first half of 2015 for the Mesha Rashi. This might be for both business and vacations. Health requires your attention from time to time during the second half of the year. Do not neglect symptoms of ill-health as it might lead to something bigger in the long run. 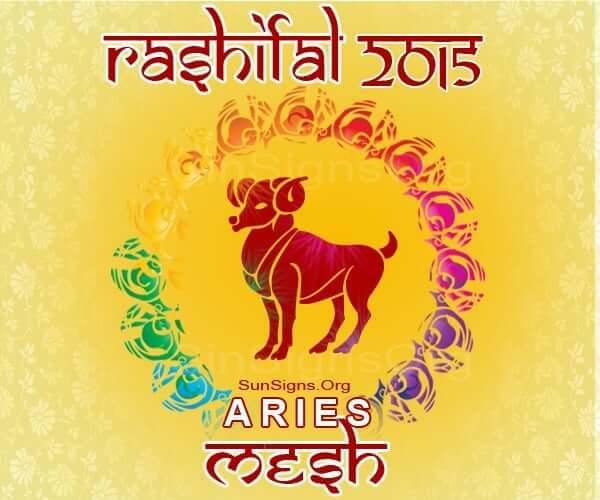 The 2015 Mesh Rasi forecasts an overall auspicious and prosperous year for people born under this moon sign. Try our Rashi Calculator to get your Rasi by date of birth analysis online.